Updated: Several people have emailed and commented asking about the high broadband prices calculated for North Carolina, and Bandwidth.com has now written a blog post explaining where it got those numbers. Basically the high results are because the test took both upload and download speeds into consideration and apparently North Carolinians pay more than others but also have much slower upload speeds according to Bandwidth.com. The folks at Bandwidth.com, which offers wholesale voice services to many application providers, launched a website Monday with a broadband map that will offer people insights about the quality of service, the speeds of service and the price others have paid for broadband available in their area. The map borrows from the National Broadband Map — launched last month by the National Telecommunications and Information Administration — in the form of an API call that takes some of the data shown on the federally funded map, but it also adds true crowdsourcing and machine learning to deliver a greater variety of information. David Morken, the CEO of Bandwidth.com, says his map, found at broadband.com, uses information pulled from a variety of other broadband services in addition to the broadband map. For example, it uses data from Ookla as well as information carriers provide to Bandwidth.com in order to sell their services to the small and medium-sized businesses. Generally, carriers have been reluctant to deliver the level of detail in their mapping data that Bandwidth.com will deliver, but Morken is confident carriers will see the benefits form greater transparency through greater sales. He added that having a level of accountability that high-quality data will provide is a benefit as consolidation continues across the wireline and wireless industry. I tend to agree, which is why I will be excited to play with the broadband.com map to see what it has today and what subsequent visits will provide. Because every person that visits can offer their speed test data as well as information about their connection quality and speeds, the quality of the data is far more diverse than what’s offered today on the National Broadband Map. 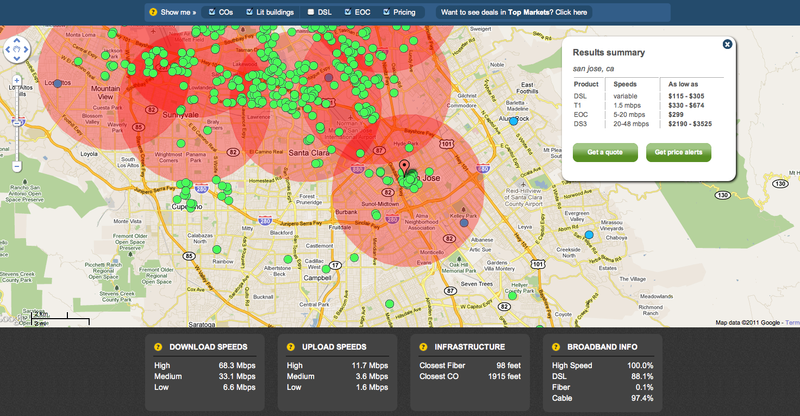 The data at the broadband.com map will also be updated in real-time, as opposed to every six months for the NTIA’s map. I don’t follow. I get 12Mb/s in Raleigh and I pay about $45 a month for that service, not $732 a month. Those numbers make no sense. I updated the story to reflect what Bandwidth.com has written about its data in response to questions on the topic. The numbers for NC are EPICALLY WRONG. I don’t think this can represent consumer rates. I have recently lived in Raleigh and Wilmington and this doesn’t seem accurate. I worked on contract with TWC RR in Wilmington for a number of years and they were getting higher Mbps in observed upload speeds alone at that price point in 2005. The average cost per mbps on the Top Ten list strikes me as unrealistically low. What is the average cost per subscription and average speed of subscriptions used to develop this data? Is the service provided by public or privately owned networks? I’m in Denver here on Qwest fibre getting 40 Mbps / 80 bucks a month which would be $2 per, so how would those numbers seem inaccurate? What service are you buying? Is this some type of “bundled” package? Does your $2.00 per mbps include all related cost (e.g. local loop access). If so, the cost of doing business in Louisiana is obviously much higher. The average cost per mega/s is really high for North Carolina. Is this the cost per Mbps for large business only? The data they use is also from Ookla (the people behind Speedtest.net) so this also includes residential information as well. why does north carolina seem to have a spike in cost per mega/s? Because Time Warner Cable and AT&T have near-monoply status in the state. There’s practically zero choice in most cities — slow, expensive DSL or slow, expensive cable, take your pick. And now that the telecoms have bought off the state house, their third attempt, in three years, aimed at outlawing any potential competition from municipal broadband seems like it will actually pass.